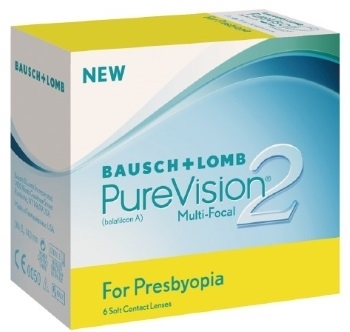 PureVision 2 Multifocal contact lenses for presbyopia offer optimum comfort and exceptional visual clarity. The lens's 3-Zone Progressive Design provides stunning vision at all distances. Purevision 2's special High Definition Optics eliminate blurs, glares and halos for a crystal clear view without visual interference. The new advanced AerGel lens material protects your eyes from protein and debris build-up without inhibiting the flow of oxygen. With up to five times more oxygen for improved ocular health and Bausch & Lomb's ComfortMoist Technology, this lens is a great choice for an all-day comfort lens experience.